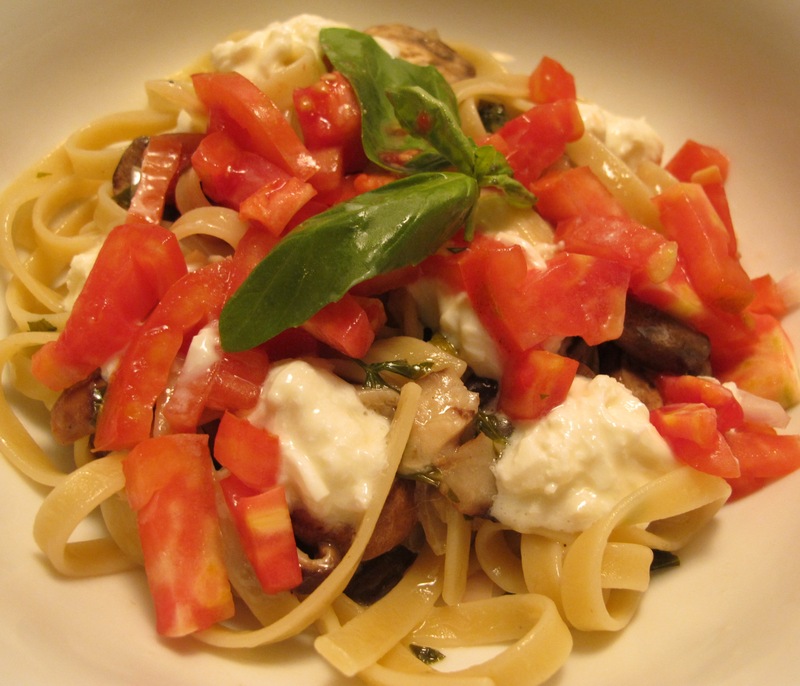 For this week’s Feast Under $5, I’m cooking Lemon Herb Pasta with Mushrooms, Tomatoes, and Burrata, a fresh Italian cheese made of mozzarella and cream. Burrata looks like a large ball of mozzarella, but it is softer in texture and, unlike regular, bland mozzarella, is sweeter in taste. I also use the optional addition of truffle salt, which adds another layer of depth to this dish. Truffle salt – usually $5 for a small jar – is about half as expensive as truffle oil, and lasts a long time because you only need a dash. You don’t have to use it, just as you could substitute less expensive (though less interesting) mozzarella for burrata, but I want these Feasts Under $5 to be fun. Cheap food can be boring, and when people think “healthy” they often think “bland,” but I want to prove that it doesn’t have to be. Trying something you’ve never had before – like burrata – can make anyone more excited about shopping, cooking, or eating. I wish everyone was so excited about eating that just looking at a McDonald’s burger made them want to gag. In a large saucepan over medium heat, saute shallot, mushrooms, lemon juice, basil, and parsley in the oil and butter until shallot is translucent. Add wine and simmer for 3-5 minutes. Add salt and pepper to taste. If using truffle salt, add now In the meantime, cook 1 lb of pasta (preferably fettucine) in salted water. Drain cooked pasta, add to saucepan, stir. Add burrata or mozzarella, stir to distribute. Portion into bowls and top with tomatoes. Total: $19.74, or$4.93 per serving. Again, this assumes you’ve already invested in the pantry staples.